EPA and the National Renewable Energy Lab have produced a database of more than 15 million acres of public and private lands around the country that are Superfund or other brownfield sites and where renewable energy can be produced – its called the ‘RePowering America’s Land’ Initiative. They have been providing funding for evaluation, feasibility studies and planning necessary to install renewable energy infrastructure on these sites. For example, in Pennsylvania acid mine discharge sites are being evaluated for hydropower microturbine installation. 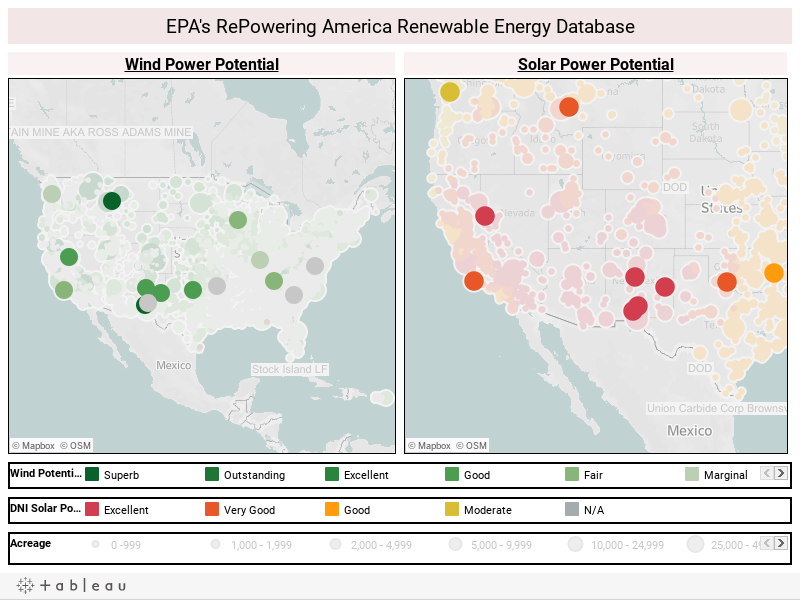 EPA has a series of static maps you can use to see where the best solar, wind, geothermal and other renewable energy sites are in their database, however its difficult to understand the types of site and power potential without being able to explore the data yourself. The visualization linked to below uses EPA’s data ( sites > 10 acres) on solar energy potential for sites, wind potential of landfills, brownfield, Superfund, abandoned mines and other sites and EPA programs. Unfortunately, there are few sites in California and the Southwest of a size to support commercial scale solar power except sites on U.S. military lands. Using the legends at the bottom, you can select and view only large or small sites, excellent wind power sites, the highest solar potential sites, and EPA programs individually. Click the static image below to open the visualization in a new window. Note that, because of the large data size, the initial load time may take several seconds.